One thing I was looking forward to at the last Gibraltar show was finding some Patrik Stefan stuff on the cheap for my newly started player collection. I figured that since he is not the most collected player in the world and that he was never a Red Wing, I could get a great deal. Well I did manage to find a few things, and that's what today's post is all about. I'll start with the best of what I came home with, a 99-00 BAP Millennium Signature Series gold autograph. This one I found in a box of priced-as-marked inserts for just $3. Not bad considering I would've likely paid that much just to ship something from eBay anyway. That was the first auto I got for the PC, now it's time for the first jersey card. I found this one in a binder full of miscellaneous inserts. I had actually never seen this set before and after seeing the price was just $1.50, I couldn't pass it up, even if it is just a plain white swatch. That's it for the good stuff. The rest was just base, inserts, and a few base rookie cards. The first of which was this one from 2001-02 Atomic, a set that I actually really like. It's printed on a nice thick and shiny card stock with the team logo die cut out of the corner of the card. These cards always tend to stand out in a quarter box. Next is one of the rookies from 1999-00 Pacific Paramount. Then there was this RC from 1999-00 Pacific Prism. Followed by this RC from 1999-00 Topps Stadium Club. The last RC was this one from 1999-00 Wayne Gretzky Hockey. Time for a couple of inserts now. The first was this Gold Medallion from 2005-06 Fleer Ultra. 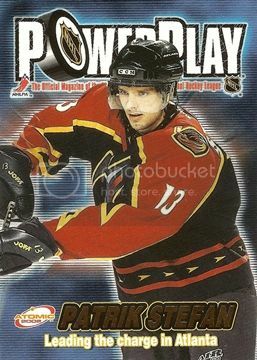 The last one was this Power Play insert from 2001-02 Atomic. This makes for 9 new additions to the PC, not bad for the first time being on the lookout for this stuff at a show, right? There is actually a ton of stuff out there for Stefan between 1999-00 and 2005-06, so it should be fun to try and track it all down. The best part is that it's a fixed checklist, unless someone decides to include him as a Thrasher in a new set, which I'd say is about as likely as the Blue Jackets winning the Cup anytime soon. Anyway, after this I'm waiting on a couple of Stefan eBay pickups, so stay tuned for those. This past weekend I made it out to one of the monthly Gibraltar Trade Center shows and managed to grab a few things for several of my PC projects. Today I will focus on my Goaltending Gallimaufry pickups, all of which I was able to find in various quarter boxes. The first is this Adam Berkhoel from 2005-06 Fleer Ultra. It's a Gold Medallion version which almost helps highlight the mismatch between his Thrashers jersey and his red, white and black equipment. 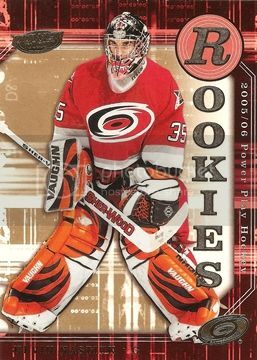 That color scheme actually came from his time with the Gwinett Gladiators of the ECHL. Click here to see their uniforms at the time. 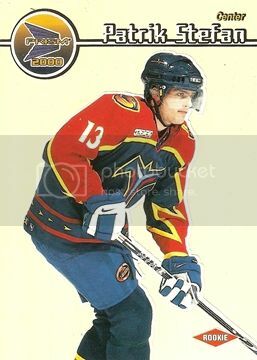 The second is another former Atlanta Thrasher, Frederic Cassivi. 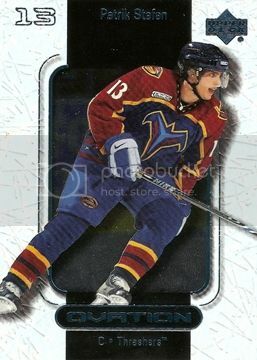 He is pictured in the Thrashers dark uniform with mismatching black, maroon, and white equipment. 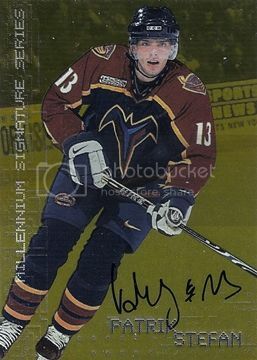 Not 100% sure, so this is either from his time with the Hersey Bears or the Chicago Wolves, where he split time for the 2001-02 season. 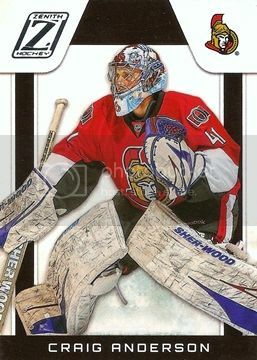 Next is another Craig Anderson for the project, similar to the last one I pulled from a pack of Score. He is pictured in the Senators home red uniform and his Colorado Avalanche equipment makes for a perfect Gallimaufry candidate. By the way, did you notice the Ottawa sticker on the chin of his mask? Time to jump back in time to a busy period for hockey cards. 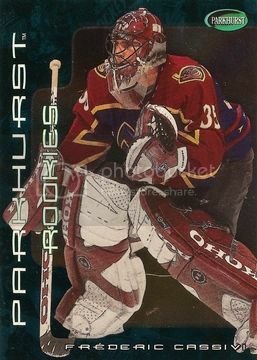 This Marty Biron is from one of Pacific's many sets from the late 90's, early 2000's. 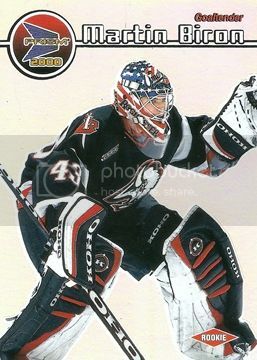 While the mismatch is not as obvious because he's got the right pads, the Rochester Americans mask still makes this one another good candidate for the project. 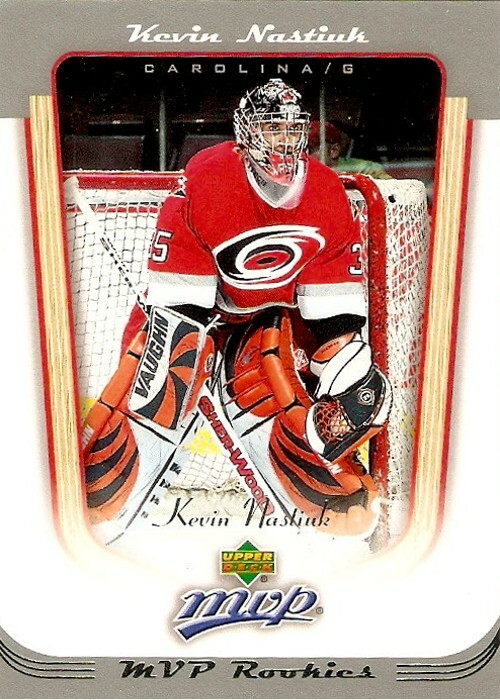 Next we have another repeat offender in Kevin Nastiuk of the Carolina Hurricanes. Click here to see the first one. He is pictured here in Carolina's dark jersey with orange, white, and black equipment. This is the result of his time with the Medicine Hat Tigers of the WHL prior to being drafted by the Hurricanes. Lastly we have Cedrick Desjardins of the Tampa Bay Lightning. He is pictured in Tampa's home black uniform with blue and white gear that has redish orange trim, definitely a mismatch if you ask me. 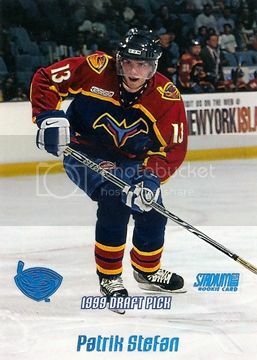 It's either from his time with the Norfolk Admirals or the Hamilton Bullgods of the AHL. He does have a nice Lightning themed mask though. That's it for today, six excellent pieces for the growing collection. These bring me almost to the 100 mark, which is pretty neat if you ask me. I wonder how far this project can take me as there has to be at least a few goalies every season that change teams without chaning equipment, am I right? Lately I've been thinking about venturing into selling things on eBay, mainly stuff other than cards from my hockey collection (i.e. jerseys, action figures, etc). I've already got myself setup with a seller profile and have nearly 100 positive feedback as a buyer. I just have to take the next step and actually get something listed. My question for you guys is do you have any advice on getting started as a seller? Anything to watch out for or any tips and tricks you're willing to share? I don't want to do this as a means to make money, just get rid of some stuff I don't care for anymore and fund my seemingly constant card purchasing. Today's mail brought in another card I've been waiting for the last few days now after I jumped on another great BIN deal from eBay. As the title suggests, its another one for my Super Script set. I just seem to keep finding these things lately, which is awesome because they are incredibly hard to come by. Here's a look at my new Drake Berehowsky Super Script numbered 06/25. Like I mentioned earlier, this was another BIN purchase from eBay. I saw the listing and immediately jumped on it given the asking price. For just $4.99 and a few bucks for shipping, I couldn't pass it up considering I would likely never see one of these again. This one brings my Super Script total to 35 out of a possible 220. Click here to see all of them together. I'm off to the local card show tomorrow, so who knows maybe I'll have another update for this set this weekend. Probably not, but one can always hope, right? 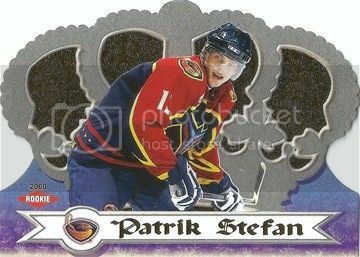 Now that I have officially started another player collection with Patrik Stefan, I thought the best place to start a show and tell of what I already have would be some of his rookie cards. 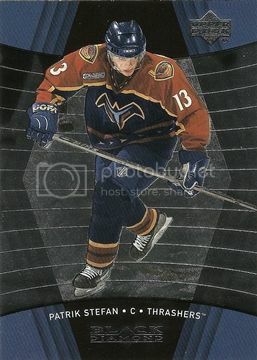 I'm sure most of you probably know Stefan was taken first overall in 1999 by the Thrashers, so his rookie season would end up being 1999-00, which is where these cards are from. Let's get things started with some good old plain base set rookie cards. It seems like this was much more common back in 1999 than in today's world. I can't think of many sets nowadays that have regular base cards listed as RC's, and by that I mean cards that aren't part of a "Hot Rookies" or "Young Guns" sections of the overall base sets. First I have one from Dynagon Ice. This was one of my favorite base card designs from that season. The only difference between this RC and the rest of the base set is the little "Rookie" stamp in the lower right hand corner. Next is one from another Pacific set, Omega. While it's not the greatest design in the world, it's still pretty decent compared to some of the stuff out there now. Like the Dynagon Ice, this one has the same stamp designating it as a rookie instead of a regular base card. Then I have yet another one from a Pacific set, this time Crown Royale. I always liked the horizontal designs they came up with for this set, as they stood out among other base set designs. Once again, the only difference between a standard base and a rookie card is the small stamp on the front. Now I can move onto some of the UD rookies I accumulated over the years. First is this one from Black Diamond. Beckett lists this one as an official RC for Stefan, but as you can see from the scan, it is just like any other base card from the set, unlike the Rookie Gems distinction they have nowadays. The last one I have for today is from a now defunct UD set, Ovation. This is another listed as an official RC, but you wouldn't know it next to any other card from the base set. It does have a neat texture though, kind of like ice that's been skated on. So how was that for a little bit of a blast from the past? 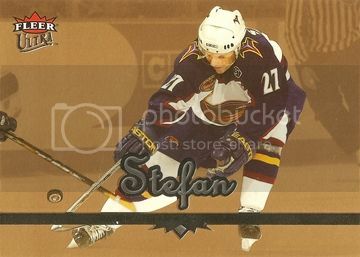 I have to say that I am really looking forward to tracking down all of Stefan's cards from the 1999-2004 range as there were some pretty neat (and awful) base and insert designs back then. Just getting back from another great weekend in Michigan's Upper Peninsula (minus the drive of course), so why not finish it off with one of my favorite things to do. Today's post is another one in a good streak I've hit lately. As the title suggests, I have myself another Super Script parallel for my MVP SC Edition master set project. This one was kind of came out of nowhere last week. I was at the mall and stopped for a few minutes to check a few things on my phone, eBay being one of them. I did a quick search for Super Scripts and was surprised to see one from my set with a BIN that had just been listed less than an hour ago at that point. Talk about good timing. Here's a look at my new Todd Reirden Super Script numbered 15/25. Not the biggest name in the world, but hey when you're working on a set like this the focus on "who" kind of goes out the window, am I right? Anyway, the other good thing about stumbling upon this one was the BIN price. I got this one for just $2 and a few dollars for shipping. Definitely can't complain about that. This one brings the Super Script total to 34 out of a possible 220. I now have picked up 11 of these things in 2012. That's a much better pace than I was on with this set in past years. That said, it's not a race and I have all the time in the world to complete this set. Hey, at least I haven't given up on it yet, right? Updates for this set seem to be coming in bunches lately, which is definitely a good thing. To continue that trend, today's post is about the fourth card included in the trade that brought me the three Silver Scripts from my last post. I said this one would be very similar to one of those three and I'm sure you can see why now. Here is the Ron Tugnutt Gold Script numbered 064/100. This one brings my Gold Script total to 47 out of a possible 220. I can't believe I almost have 50 of these things now. Back when I decided to go after these in addition to the Super Scripts, I would've never thought I would be this far this quickly. Thanks to eBay, SCF and my fellow bloggers, I think this set is definitely off to a good start. Not sure how long it will take to come up with all 220 of them, but I am definitely looking forward to the journey getting there. It's been a while now since I actually posted an update for the Silver Script portion of my MVP Stanley Cup Edition master set project, so when I opened the bubble envelope that came in the mail today, this was the first thing I wanted to do. Today I've got three cards to add to the set from a recent, well relatively recent, trade over on Sports Card Forum. I was getting kind of nervous that the cards were either never sent or lost in the mail as the trade was posted nearly a month ago now. 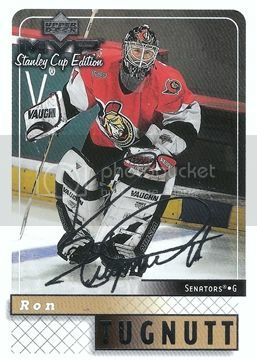 The first of the three was this one featuring Ron Tugnutt. Then there was this one featuring former Red Wing Mike Vernon. 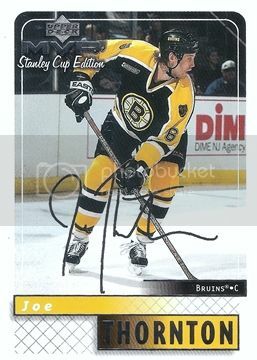 Lastly there was this one featuring former Bruin Joe Thornton. Of the three, the Thornton was probably the most significant. Why? Because it completed another 4-card rainbow for me (Base, Silver, Gold, and Super). Click here to see the thread I started over on SCF for all of the rainbows I have for this set. There was also a fourth card included in the trade, which will most likely be in my next post, so stay tuned for that. I'll give you a hint, it's very similar to one of the cards above. Lately I've been tossing around the idea of adding a second player to my always expanding collection, for the second time now. 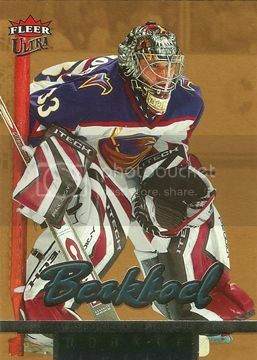 This may sound familiar because I did a similar post back when I decided to start up a Dominik Hasek collection. That didn't go so well as it was kind of overwhelming seeing the actual number of cards he had out there. So eventually I gave up on it and stopped actively pursuing his stuff. It's been a while now since I made that decision and with more and more competition arising for Jimmy Howard stuff, I wanted to find myself a player who would be a bit more manageable. That being said, I've decided to start collecting Patrik Stefan. 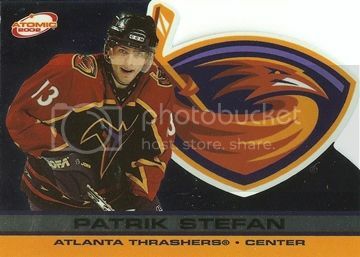 That's right, Patrik Stefan, the former 1st overall pick of the Atlanta Thrashers who is best known for his empty net flub with the Stars a few years back. Why, you ask? The answer to that goes all the way back to 1999, when Stefan was all the hype coming into the season. I was only 12 years old at the time and somehow got onto the Patrik Stefan bandwagon. Not sure how or why, but I became a fan of his and he was actually the very first player I got a TTM autograph response from. So there is a reason for this choice, I didn't just pull it out of thin air for the sake of picking a random player, because really who would really want to collect this guy? There are also a few other things that make collecting him appealing to me. 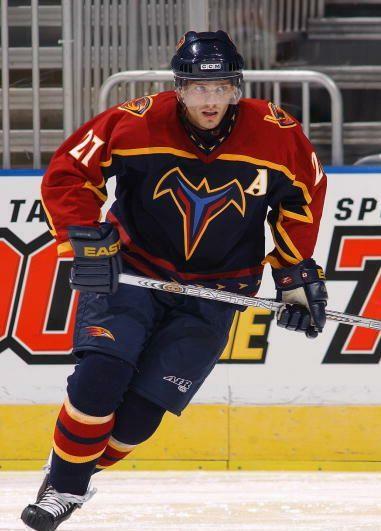 First, he is primarily pictured in one of my all-time favorite NHL jerseys (the dark Thrashers seen in the picture above). 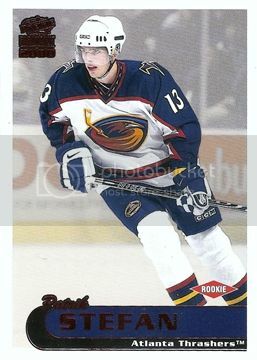 And second, he wore my one of my favorite numbers, 13, during the first several years of his career with the Thrashers. 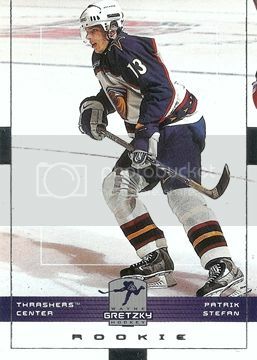 Patrik was selected 1st overall by the Thrashers in 1999, placing huge expectations on the centerman from the Czech Republic. 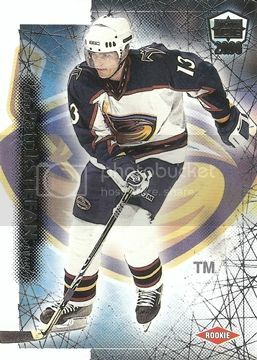 As most of you probably know, he did not live up to those expectations after several injury filled seasons with the Thrashers. In total, he would go on to score 188 points in 455 games, which makes him statistically the worst 1st overall pick in the history of the NHL. If you're curious about him and his ill-fated career, click here to read a pretty good article about him. Finally, I am going to set some parameters for this player collection. Since Stefan is retired now, there is an finite number of cards of his out there. 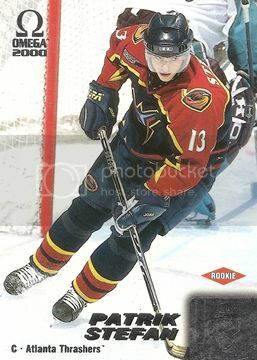 That said, I plan to only collect his cards ranging from his rookie season (1999-00) all the way up to his last season with the Thrashers (2005-06). This is kind of nice, because it gives me something to look for in the years before the stuff in my Howard collection. Now I get to go after a bunch of really cool pre-lockout cards, plus they're all pretty cheap. So what do you guys think of my decision to go after Patrik Stefan in addition to the other projects I have going. Also, be sure to let me know if you have any of his cards laying around that you don't want or need. Time for another update on my main player collection, which has kind of taken a backseat to my other projects recently. That said, I am still always on the lookout for good deals on Howard stuff, which is why I'm able to write this post today. This card is from a set from Jimmy's rookie season, 2005-06 UD Ultimate Collection, and features a nice big piece of red jersey material. The only downside is that it's a "photo-shoot worn" piece of material. Not as cool as "game-worn" but still a nice addition. On a positive note, I did manage to get this one for what I thought was a great deal at just $5 plus shipping. It's from his rookie year, numbered out of 250, and is just a great looking card, so at that price I couldn't pass on it. How do you guys feel about the whole "game-worn" versus "event-worn" memorabilia pieces. At least with the latter the player did actually wear the jersey, but I can definitely see how most would not find it as appealing as something that you would've seen in a game in person or on television. Time for yet another update on the most important part of one of my set projects. I was lucky enough to stumble upon three of these things in the last week on eBay, one of which I did not win, but that's ok as I still came out with more than zero, and that's always good. This time I found two listings from the same seller as the Naslund Gold and Super Scripts I bought last month. Both had $0.99 starting bids, so when I found them I threw down my max bid and just waited til the end. Obviously, I got them, or I wouldn't be writing this post. 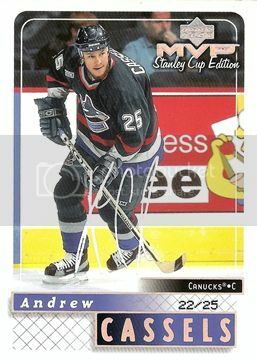 The first was this Andrew Cassels numbered 22/25. 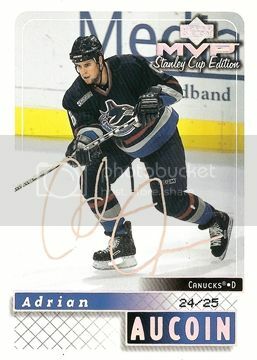 The second was this Adrian Aucoin numbered 24/25. Not bad if you're a Canucks fan, eh? The thing that kind of surprised me was the ending bid for both of them considering what I paid for the Naslund just a few weeks ago. The Aucoin set me back $7.00 and the Cassels just $8.00, but hey I'll take it. These two bring my Super Script total to 33 out of a possible 220. That's exactly 15% of the way there. I would've had 34, but I got sniped at the last second on an auction for a David Legwand, but you can't win them all, so I'll just hope another one pops up someday. 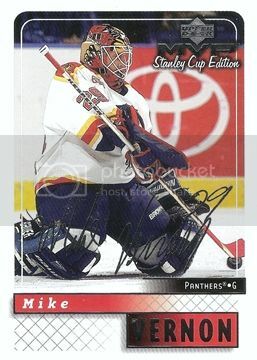 Now that I only need a handful of cards to complete my 1996-97 Metal Universe base set, I figured it would be a nightmare tracking down the last few, but I was wrong. Thanks to Brad over at Cards from the Crease, I am now two cards closer to a complete set. 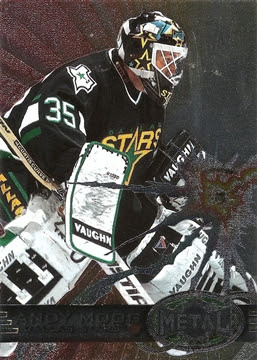 The first was this one featuring Andy Moog of the Dallas Stars. 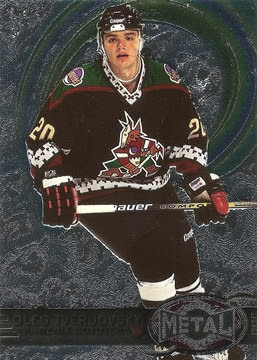 The second was this one featuring Oleg Tverdovsky of the Phoenix Coyotes. Both are pretty cool cards. 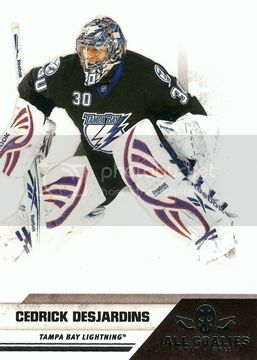 I really like the Moog though, as the goalie cards from this set are probably the best looking of all. I really wish someone would resurrect this set from the dead and bring it back for another go round similar to some of the other reboots out that are out there now thanks to Panini. Anyway, these two bring my base set total to 197 out of the 200 for the set. That leaves me with three cards, which will probably be the three most difficult to track down, right? And thanks again to Brad over at Cards from the Crease for sending these two my way. Since I don't have anything from the mailbox to show off today, I thought I would jump back into my Captured on Cardboard series with another moment from a Bruins Stanley Cup clinching game. This card was part of a group I picked up at the last Gibraltar show. This one comes from the 2011-12 Pinnacle base set. One thing I love about this set is that some of the base cards depict a specific moment along with a description of that moment on the back. Kind of makes it easier to find cards for this project, doesn't it? Anyway, this card has a great shot of Bergeron's second period short-handed goal in Game 7 of the 2011 Stanley Cup Finals. It was definitely a back breaker and helped the Bruins capture Lord Stanley's Cup. The video is a bit long, but I'm sure any Bruins fan will appreciate it. Sorry any Canucks fans out there. The live shot of the moment pictured can be seen around the 6:19 mark. There's a better view during one of the replay around the 6:47 mark. Pretty cool, eh?